Family connections are among the most poignant facets of the impact of war on society. From those linking siblings who served, and those binding them to the families and communities they left behind, to those we have with people we have never met but with whom we nevertheless share an unbreakable bond, we remain fascinated with the ties of blood in times of war. In this article, we would like to share with you the story of the Symon family. Oscar Sturt was the only one who enlisted in and with an Australian unit. Nevertheless, each of the sons, along with many other members of the Symon family, made an important contribution to the war effort. “A Knight and His Four Fighting Sons,” The Observer (Adelaide), 21 October 1916. 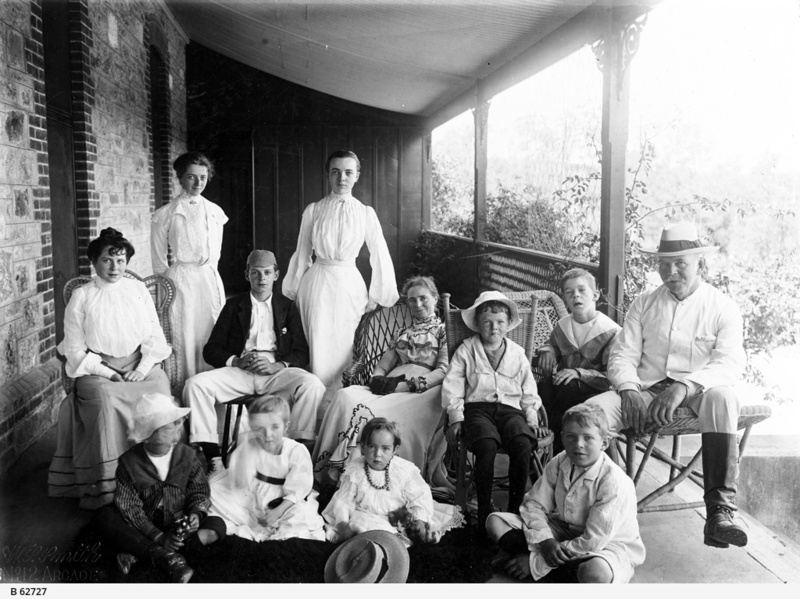 Members of the Symon family at Manoah, Sir Josiah Symon's residence at Upper Sturt. Standing L-R: Margaret and Kilmeny. Seated L-R: Lenore, Charles, Lady Mary Eleanor Symon, Carril, Romilly and Sir Josiah Symon. Seated in front L-R: Oliver, Angel, Mary and Oscar. State Library of South Australia, B62727. When war came to the world, the entire Symon family threw itself wholeheartedly into the war effort. The eldest son, Charles James Ballarat Symon, who had been born aboard the SS Ballarat on 1 July 1886, enlisted into and was promoted to a Second Lieutenant in the Coldstream Guards. The second son and the only one to enlist in an Australian unit was Oscar Sturt Symon. Born at Upper Sturt on 28 March 1891, Oscar served initially with the 27th Battalion and finished his military career as a Lieutenant in the 1st Australian Cyclist Battalion. Both of the younger sons were born in Fitzroy, most likely at Sir Josiah and Lady Symon’s residence, ‘Fitzroy House’,2 and both enlisted in England. Carill Hector Nicholson Symon, born 22 September 1893, served as a Second Lieutenant with the South Lancashire Regiment, while the youngest, Oliver Jose Lewers was a Sub Lieutenant with the Royal Navy, serving on the destroyer HMS Penn. Fortunately for the Symon family, German claims to have sunk the Penn while she was picking up survivors from the HMS Nottingham proved to be false. On the home front, Sir Josiah and Lady Mary demonstrated commitment to the cause. Sir Josiah argued for conscription. His comments on the conscription referendum, published in The Register on 30 October 1916, made his sentiments clear. Given a state funeral in 1934, Sir Josiah demonstrated the strength of his convictions to the end, with his executors having to apply to the High Court to have “scandalous, offensive and defamatory words” removed from his will.10 In many respects, the Symon family were privileged, but it is in one respect in particular that resonates with us this December; of the four sons who went away to fight, four returned. Very few families had that fortune in the Great War. 1 Dean Jaensch, “Party, Party System and Federation: 1890-1912,” in Dean Jaensch (ed.) The Flinders History of South Australia: Political History, South Australia: Wakefield Press, 1986, 178-214. 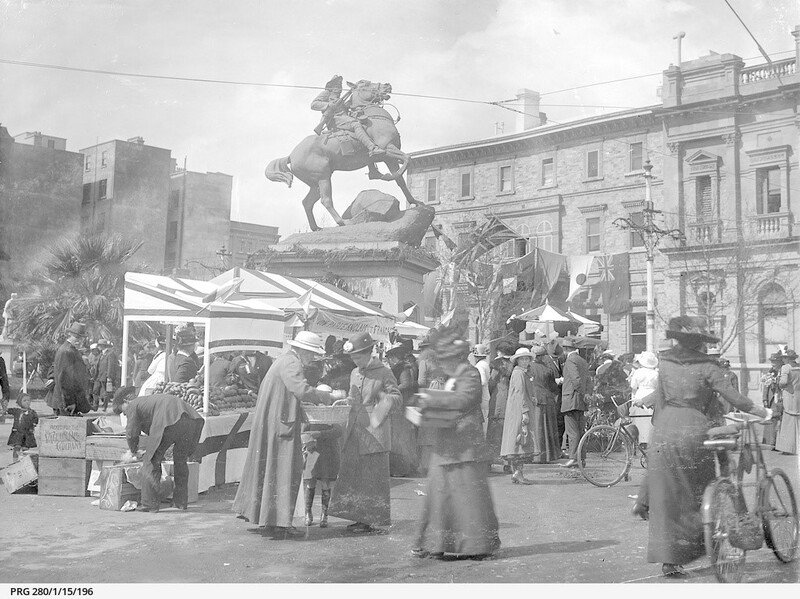 2 “Fitzroy House,” South Australian Heritage Places Database, Department of Environment, Water and Natural Heritage, accessed 27 November 2015, http://apps.planning.sa.gov.au/HeritageSearch/HeritageItem.aspx?p_heritageno=3190. 3 “A Knight and His Four Fighting Sons,” The Observer (Adelaide), 21 October 1916. 4 “Sir Josiah Symon Outspoken,” The Register (Adelaide), 30 October 1916. 6 Margaret Kelly, “SA’s Legal Profession in World War I,” Bulletin (Law Society of South Australia), 36(8: Sept 2014): 12. 7 “Red Cross Information Bureau,” The Advertiser, 5 January 1916. 8 “Death of Lady Symon,” The Advertiser (Adelaide), 29 December 1944. 10 Don Wright, “Symon, Sir Josiah Henry (1846-1934),” Australian Dictionary of Biography, National Centre of Biography, Australian National University, http://adb.anu.edu.au/biography/symon-sir-josiah-henry-8734, published first in hardcopy 1990, accessed online 27 November 2015.